The Russian culture, arts, and crafts of the tenth to the seventeenth century are a foreword to the history of Russian folk art in the subsequent centuries. In the early eighteenth century, rapid economic growth, accompanied by the development of manufacturing industries, towns, and nationwide trade, gave an impetus to flourishing and very varied folk arts and crafts. Peasant art, which is always closely connected to everyday life, was affected to some extent by modern urban culture. 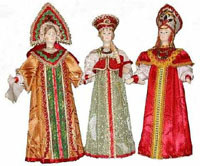 Still, a certain patriarchal character of the Russian life-style helped preserve the local traditions and flavor in folk art (as was the case with folk songs and Russian vernaculars). In northern Russia, particularly on the Pechora, Onega, Pinega, Mezen, and North Dvina Rivers (the territory of the present regions of Arkhangelsk and Vologda), the traditional way of life with its old-fashioned farming, age-old customs, and vestiges of heathen beliefs, survived the longest. Here the first recording of numerous legends, tales, wedding songs, and keens were made in the nineteenth century. The famous Russian historian Vasily Kliuchevsky called the forest "a perennial setting for Russian life." In olden times the forest was the mainstay of the domestic economy, feeding the Russians and protecting them. Forts, houses, mills, wells, and other important structures were made of wood. Every peasant was well versed with the properties of different woods and used them astutely. Thus pine trees were felled for building houses and for making sledges, looms, and distaffs; birch was used for runners, skis, carts, and boats; kitchenware and toys were made of aspen. Russian villages were built entirely of wood. In the north the peasants preferred large houses that included sizable barns for livestock and that were big enough for a hay wagon to enter. The exterior decoration in the north was more restrained than that of the izba in the smart central Russian or Volga region; such houses, though smaller, were decorated with intricate carved and painted woodwork. It was also an old custom to decorate the izba's interior with painted designs, which appeared on the floor, walls, furniture, and baby's crib. Among the extant wooden objects once used in peasants' homes the distaff predominated. A whole tree was usually felled for just one distaff, which would often become a treasured heirloom. A distaff was a father's gift to his daughter, a young man's to his fiancee. The craftsman's ingenuity in decorating distaffs was truly boundless, for no other object was adorned with such painstaking care and affection. In northern Russia it was the vertical blade that carried the bulk of ornamentation. Distaffs from Yaroslavl Province were remarkable for their exquisite carving and elegant proportions: tall and slender, they resemble a tower with tiers of pierced arched openings and tiny twisted columns. Though they are typical of the eighteenth century and first half of the nineteenth, another type of distaff was also employed in the same area at that time, with the base formed by a broad plank supporting a blade in the shape of a kokoshnik headgear carved in low relief, with clock towers, and festival and tea-drinking scenes. Distaffs from Vologda are more solid in design and carved in high relief, sometimes in combination with painting. The ubiquitous large rosette in the center of the geometric ornamentation is an ancient symbol of the sun. The lower end of the blade is adorned with pendant decorations, also in the shape of rosettes. Among distaffs from the north of Russia, those from the Mezen and Northern Dvina are particularly notable for their rich and varied painted decorations, in which exquisite silhouettes of horses, birds, and deer, drawn with calligraphic precision, alternate with rows of lines and scrolls. Soot and red clay from the river bank are used as pigments. The reverse side of the blade is painted with genre or hunting scenes. The painted compositions adorning distaffs made in the village of Borok follow the traditional pattern, with the lower part consisting of a picture within a rectangular frame, quite often a scene of sledging. The middle part usually consists of a tree or a flower within an arch, while the upper part is painted with symmetrically arranged windows. The bright vermillion and green of the painted decoration stand out boldly against the white or sometimes gold background. In central Russia and along the Volga, distaffs with a decorated base were in common use. After work the spinner would detach the base from the staff and hang it on the wall as a decoration. Distaffs from the town of Gorodets on the Volga were particularly popular. They carried pictures of riders on rearing horses, hunters with dogs, or trees with birds. They were decorated by carving and with dark water-seasoned oak inlay. In the mid-nineteenth century, their subject matter became more diversified, and genre scenes from urban life, sumptuously bordered with draperies and festoons of flowers, began to predominate. In the area adjoining the Volga, one of the most venerable crafts, over three hundred years old, is the production of lathe-turned wooden articles painted in the so-called Khokhloma style with grass, berries, and flowers in red, gold and black. Named after the village trading center Khokhloma, it was one of Russia's most important handicraft industries in the late nineteenth century. Khokhloma ware was sold along the Volga, in Central Asia, in the Caucasus, and in the Near East. The technique is peculiar: first the unpainted wooden article is coated with special priming, then with drying oil and a thin layer of aluminum powder. The "silvered" object is then painted with heat-resistant oil, varnished, and fired. The characteristic gold color appears during this final stage, when the article is kept in a kiln at up to 90�C. At present the production of Khokhloma ware is concentrated in the town of Semionov and the village of Siomino. The characteristic color range has been preserved, and the painting continues to be based on extemporaneous work without preliminary sketching. Toy-making by folk artists plays an important role in the culture of any nation. This craft is linked with folklore, old beliefs, legends, and fairy tales, as well as with an insight into a child's inner world. There is always room for the artist to give free play to his fancy. The main materials for toy-making were wood, pinecones, moss, straw, and clay. The most archaic types of imagery are shown in the extremely generalized wooden dolls and horses carved in the north of Russia. An entirely different approach is seen in the work of the Vladimir and Nizhni-Novgorod craftsmen, whose horses are painted with bright red lead. Nizhni-Novgorod's specialty was a carriage with two or three horses. By virtue of their elegant proportions, precise carving, and bold contrasting colors, these toys deserve the designation of works of art. The village of Bogorodskoye in the vicinity of Moscow is a large toy center. The industry is connected with the history of Zagorsk (formerly the trading quarter of the Trinity-Sergius Monastery), where painted figurines of ladies and hussars, as well as scenes modelled on lubok folk pictures were quarter of the Trinity-Sergius Monastery. Today's most famous matrioshkas come from the town of Polkhov-Maidan in the Gorky Region, as well as other gaily painted wooden articles such as money boxes with naive landscapes on the lid, mushroom-shaped needle cases, painted eggs, apples, and whistles in the form of birds. Contrasting scarlet, green, and violet coloring (in aniline dye) over starch priming, with outlines delicately drawn in pen or brush, are the most characteristic features of the Poikhov-Maidan articles. In the eighteenth and nineteenth centuries, apart from making figurines and toys, folk carvers produced statues in the round, which were sometimes painted, for churches and chapels. The standard of execution varied a great deal, yet most of the images carved by peasant artists bear the stamp of sincerity and even drama. Birch bark, or, rather, its outer layer, was widely used in Russia from the dawn of its history. Letters written on bark that date back to the eleventh-fourteenth centuries survive to this day. In peasant homes, cylindrical tuyes vessels made of birch bark with lids were commonly used to contain sour cream, milk, flour, and groats or for soaking cloudberries and cranberries in water. These vessels were decorated with stamped or cursorily painted designs. In the nineteenth century, a center for this industry emerged on the Shemoksa River, where these traditional birch-bark vessels, boxes, and dishes are still produced as souvenirs. Skill was also required to make boards for stamping designs on cakes (prianiks}, which were baked for Christmas feasts, given as presents to guests at wedding celebrations, and dispensed at funerals. It was customary to bake a particular type of cake for each important occasion. Thus, for example, rye cakes in the shape of birds, cows, and sheep were prepared for the day when domestic animals were pastured for the first time in spring, whereas for the winter solstice the form of deer was recommended. Even as recently as the beginning of the twentieth century, enormous quantities of cakes were sold at Russian fairs. Boards for making them sometimes contained up to nine different designs and measured up to a meter and a half in length. Quite often the carver's name and the place of manufacture, as well as a witty proverb or message with good wishes, were also incised into the wood. Owing to the eye-catching designs, boards were often kept at home for interior decoration. The carving on stamping boards is similar to that of molds for tiles with raised patterns and of textile printing blocks. Production of the last two was a widespread craft, which catered to the textile dyeing and printing trade current in many Russian provinces. Dyers travelled throughout the countryside to collect orders for dyeing and printing homespun cottons and to sell their wares. Their fabric-printing methods were simple: the block with a carved design was covered with a thin layer of dye and pressed to the fabric. To ensure a good print, the block was beaten with a heavy cast-iron hammer. Most rustic prints were in one color, but if more than one was desired, it was either applied by hand, or additional blocks were made for the purpose. Cotton prints were used for making clothes, such as women's sleeveless dresses with shoulder straps (sarafans), men's caftans, and padded body warmers, as well as for curtains, tablecloths, ecclesiastic vestments, and in bookbinding. Cotton fabrics often rivalled expensive cloths in beauty. Old prints are distinguished for their austere geometric ornamentation and measured rhythm reminiscent of wood carvings. Plant designs in two colors are characteristic of seventeenth-century cotton prints. In the eighteenth century, they were replaced by large flowers and foliage in red and brown tones, at times with pale blue buds or berries on a light-toned background. Blue cotton prints with a bird surrounded by plants were widely used in Russian peasant homes throughout the nineteenth century. Folk art tradition was further developed in machine-printing, which was introduced in the 1830s. In the second half of the same century, textile mill fabrics were already superseding hand-printed homespun cloths. Even then, however, some hand-loom industries survived, especially those engaged in the production of shawls and kerchiefs.